A 43 year-old Caucasian female presented with a typical complaint of chest pain and shortness of breath. Patient scaled the pain at 10/10. She denied any nausea and vomiting, palpitations and headaches. She had a 28 pack year history of smoking. She denies any history of alcohol or intravenous drug use. Her pain was relieved by nitroglycerin that she was given in the emergency room. On physical exam the patient was alert and oriented times three and in no acute distress. She presented with a grade 2/6 non-radiating systolic murmur. The remainder of the physical examination was within normal limits. Laboratory tests initially showed a troponin I of 0.28 and a CK-MB of 3.5 and the EKG in the Emergency room had ST depressions in leads II, III, aVF, V5 and V6, and an ST elevation of aVL and V2. These EKG changes improved after nitroglycerin administration. Chest X-ray revealed a widened mediastinum. A Cat scan of chest was performed which ruled out aortic dissection. a single coronary artery without atherosclerotic plaquing, and normal left ventricular systolic function. Patient underwent successful surgical repair of coarctation of aorta. Coarctation of the aorta is a commonly encountered congenital heart defect, representing 6-8% of cases . It presents as either a congenital or acquired narrowing of the aorta proximal or distal to the left subclavian artery. 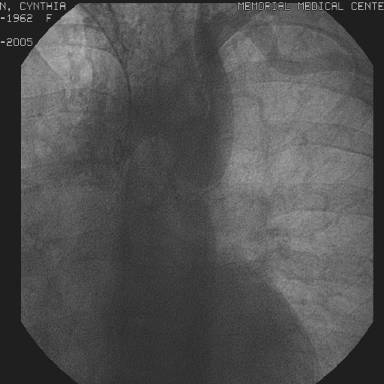 Based on pathological examinations, the site of coarctation is a result of medial thickening and intimal hyperplasia expanding into the lumen of the vessel. This condition is associated with a bicuspid aortic valve 30-40% of the time . Other abnormalities may include a ventricular septal defect, patent ductus arteriousus, aortic stenosis or mitral stenosis. Noncardiac defects that may also accompany a coarctation of the aorta are intracerebral aneurysms and gonadal dysgenesis in Turner’s syndrome (35%) . Coarctations that present with additional anomalies are referred to as complex and are usually detected in infancy. Simple coarctations are those not involving other abnormalities and are not detected until adulthood. A significant coarctation either requires a gradient of >20 across it at angiography with or without proximal systemic hypertension or the presence of proximal hypertension in addition to angiographic or echocardiographic proof of a coarctation . A patent ductus arteriosis in utero prevents a coarctation of the aorta to cause any significant hemodynamic problems. It is once the Patent ductus arteriosis constricts that a neonate may present with heart failure or shock . In milder cases, diminished femoral pulses on physical exam may be the only manifestation of the congenital defect and thus is likely to go unnoticed. Infants and children usually remain asymptomatic. Over time the left ventricle hypertrophies and can maintain a normal wall pressure, as well as a developed collateral circulation over the coarctation may lead to no pressure gradients between the lower and upper extremities. Older children may solely complain of claudication and cold extremities during exercise. Undiagnosed adults most commonly present with severe hypertension which may cause symptoms such as heart failure, headaches, epistaxis or aortic dissection . Brueck et. al., reported a patient with coarctation of the aorta who’s leading symptom was dyspnea on exertion , while Verma et. al., presented a patient with difficult to control hypertension . Acute coronary syndrome is not among the common presenting symptoms of a coarctation. Several clues to the diagnosis can be detected on physical exam of a child or adult with asymptomatic coarctation of the aorta. Continous murmurs and palpable pulsations from large collateral vessels may be detected. An ejection click and systolic ejection murmur may be present in the case of a bicuspid aortic valve. Radiographically, the erosion caused by these large collateral arteries may present as a notching of the posterior one-third of the 3rd-8th ribs . Our case depicts an unusual presentation of coarctation of the aorta as an episode of an acute coronary syndrome. Additionally, it is rare for this condition to go undiagnosed until the age of 43 since severe cardiovascular complications would be expected to have developed by this time. The Acute coronary syndrome protocol did relieve our patient’s initial symptoms; however, the severity of her returning chest pain prompted us to perform a heart catheterization which led to the incidental finding of her significant coarctation of the aorta. There have been very few reports of a coarctation of the aorta presenting as ACS. Takahashi et al. described a 29 year old patient who experienced coronary spasm leading to a myocardial infarction after the repair of her coarctation . Covens et al. described a 72 year old patient who presented with a myocardial infarction and had an incidental finding of a coarctation of the aorta with a 55mmHg gradient across it. This particular patient was found to have 2-vessel disease which was the primary cause of the MI . Although it is certain that our patient’s presentation was not due to atherosclerotic disease, the etiology remains unclear. Vasospasm verses Hypertensive Crisis are the two etiologies that most promptly come to mind. The transient ST segment elevations would decrease the likelihood for hypertensive crisis to be the case, while enforcing the hypothesis of vasospasm. Agarwala B., Bacha E., Cao Q., Hijazi Z.: Clinical manifestations and diagnosis of coarctation of the aorta. UptoDate, 2006. Nihoyannopoulos, P, Karas, S, Sapsford, RN, et al. Accuracy of two-dimensional echocardiography in the diagnosis of aortic arch obstruction. J Am Coll Cardiol 1987; 10: 1072-7. Levine, JC, Sanders, SP, Colan, SD, et al. The risk of having additional obstruction lesions in neonatal coarctation of the aorta. Cardiol Young 2001; 11:44-53. Therrien J, Webb GD. Adult congenital heart disease. In: Braunwald E, ed. Heart disease: a textbook of cardiovascular medicine. 6th ed. Philadelphia, PA: W. B. Saunders, 2001; 1600-1602. Takahashi Y., Takayama M., Sato N., et al. Restoration of Endothelial Function After Repaired Coarctation of the Aorta: A Case Report. Angiology 2003; vol. 54, number 5: 609-611. Covens C., Vermeersch P., Paelinck B., et al. Aortic Coarctation: A Rare and Unexpected Cause of Secondary Arterial Hypertension in the Elderly. Catheterization and Cardiovascular Diagnosis 1996; 39:71-74. Tobian, L. A viewpoint concerning the enigma of hypertension. Am J Med 1972; 52(5): 595-609. Brueck M., Janka R., Daniel W. G. Images in Cardiovascular Medicine: Coarctation of the Aorta. Circulation 2001; 103:e27. Varma C., McLaughlin P., Hermiller JB., et al. Clinical problems in cardiopulmonary disease: Coarctation of the Aorta in an Adult – Problems of Diagnosis and Management. Chest 2003; 123(5):1749-1752.